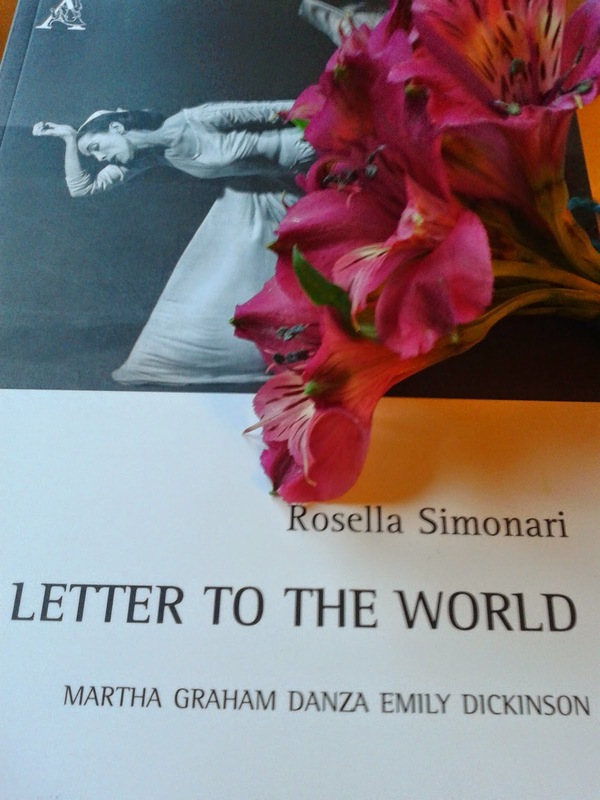 Here is a detailed synopsis in English of my book in Italian, Letter to the World: Martha Graham danza Emily Dickinson, published by Aracne, Rome, 2015. What does the word ‘choreography’ mean? Does it just mean a sequence of steps or something more layered and complex? And what does it mean to choreograph a piece? These are the questions I ask myself at the beginning of my book, Letter to the World: Martha Graham danza Emily Dickisnon, and the book itself is polymorphous answer. In the Introduction, I individuate a methodological approach that includes cultural history and dance studies. I also talk about my politics of location and my glocal perspective on Graham (as I lived, studied and worked both in a global city like London and in a small local town in central Italy). Last but not least, I also point out to a terminological question to designate Graham’s vision, finding a suitable answer in the word ‘choreosophy’. Chapter One deals with the reconstruction “on the page” (that is for scholarly, not performative purposes) and explores written, oral and audiovisual documents to map out an idea of what Letter to the World was about. These documents include reviews from the first series of performances presented between 1940 and 1941, when the piece was consistently changed, descriptive analyses, like the one written by Marica Siegel, an unpublished scenario by Terese Capucilli, oral testimonies by Pearl Lang and Armgard von Bardeleben and audiovisual material, like the 1970s black-and-white video reconstruction. Chapter Two focuses on characters and dance phrases: the two protagonists, the One Who Dances and the One Who Speaks, entertain a dialogic and fruitful relationship, while the other characters represent emanations of the poet’s personality. In particular, the dancing protagonist interprets the most demanding dance phrases of the piece, while the other characters have each a signature movement or movement quality that shapes their role. Chapter Three is about the spoken lines and the modernist-cyclical structure of the work. The lines are fundamental to portray some of the characters and, most of all, they are particularly significant in following the development of the dancing protagonist’s “inner landscape”, as Graham used to call it. Chapter Four is dedicated to the critical material published on Dickinson up to 1940. It also includes the analysis of two plays inspired by her and produced in the 1930s: Alison’s House (1930) by Susan Glaspell and Brittle Heaven (1935) by Vincent York and Frederick Pohl. This is done to show the interest in Dickinson at the time, and the different approaches these playwrights had in comparison with Graham. Chapter Five goes back in time to a piece that is both structurally and thematically related to Letter to the World, Primitive Mysteries (1931). Structurally, it follows the cyclical development I have mentioned above, while thematically, it presents the white-dressed figure of the Virgin Mary. It is a work inspired by the notion of dance as ritual, a notion that Graham acquired from her study of the Native American cultures in the Southwest, a notion that poses controversial questions dealing with colonialism and primitivism. Chapter Six treats a fundamental aspect, that of Purtianism as an oppressive and necessary force. The Ancestress, in Letter to the World, embodies this force and obliges the One Who Dances to confront her fears. An analysis of this character is done in relation to the piece and to a traditional religious community, that of the Shakers, which, in the eighteenth and nineteenth centuries, was quite widespread in the United States. Then, the examination of writer William Carlos Williams’s book of essays, In the American Grain (1925), shows his profound influence over Graham’s work, including his view on Puritanism. In the light of this analysis, the Ancestress is compared to the Revivalist in Graham’s Appalachian Spring (1944), where Puritanism is depicted in more emphatic terms. Chapters Seven and Eight take a wider look at Letter to the World, through what I call the ‘journey motif’ in Graham. Letter to the World can be considered a journey into the artist’s creative process. This journey is a theme that recurs in Graham’s choreosophy, with different articulations, depending on the period she dealt it with. In Chapter Seven, the ‘journey motif’ is analysed with regards to Graham’s interest in North American history and, in particular, with reference to the frontier theory as devised by Frederick Jackson Turner. Two pieces will be the focus of this motif: the solo Frontier and the group piece American Document. Both of them are, in a way, connected with Letter to the World, in that they deal with North American history. In Chapter Eight, the ‘journey motif’ is transformed into an inner experience, which is another fundamental component in Letter to the World and is an aspect that anticipates many other pieces to come. One of them, Errand into the Maze, is taken as reference point, because it focuses on the journey as inner battle, through an original reinterpretation of the Theseus and the Minotaur Greek myth. The Chapter closes with an analysis of Graham’s version of The Rite of Spring as it epitomises the artist’s struggle in the name of her art, a theme we already find in Letter to the World. In the Conclusion I investigate the still quite neglected relationship between dance and literature, a relationship that has, in part, caused the neglect of Letter to the World in the hope for this negative trend to change in the near future.